Product code: ES539 Categories: Sold Items, Sold Rings. 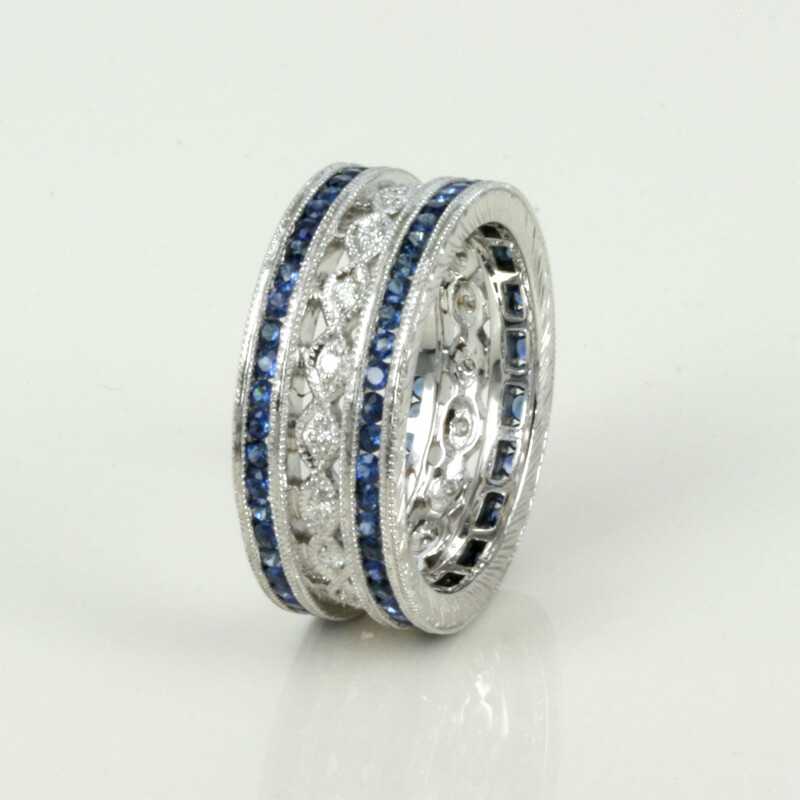 This is a very beautiful modern sapphire and diamond eternity ring made in 18ct white gold and set with sapphires and diamonds in a stunning style reminiscent of the early Art Deco rings of the 1920’s. The detail and design in this eternity ring is captivating and there are 46 round facetted sapphires on each side, and the 92 sapphires total 1.12 carats. In the centre are 18 round brilliant cut diamonds which total 0.18 carats. The sapphires are channel set and the diamond bead set and both have a milgrain finish which shows as the lovely crimping along he edges which gives this ring such an attractive appeal to it. Measuring 7.2mm wide and currently in a size “K”, the fine detail is simply superb and will always be admired when it is worn and as this is a new ring, we can order this in any size with other gemstones such as rubies or emeralds as well as in 18ct yellow gold or platinum.